It's backkkkkk. 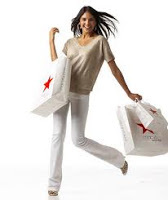 Macy's is having a massive one-day sale with massive discounts across the massive store. Between that and their web buster specials you can save up to 70% through midnight. Clothing, shoes, jewelry, appliances, home items, furniture, luggage, and more are clearing the shelves as we speak. If you want to save even more then go to the clearance section where they are taking an extra 25% OFF already marked-down items. Click here to view the sale at Macy's.